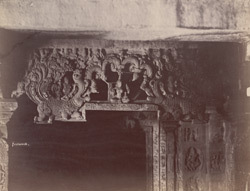 Photograph of the door lintel of a shrine of the Navalinga temple at Kukkunur, taken by Henry Cousens in the 1880s. Kukkunur is situated in the modern state of Karnataka in an area that was known as the Dharwar district when this photograph was taken. The construction of the Navalinga temple dates to the late 9th century when the temple was built in the Late Chalukya style. The complex is situated in a courtyard and consists of nine shrines covered by a multi-storey square tower which are built around three columned porches. The shrines were originally dedicated to a variety of female deities. The outer walls of the temples are relatively unadorned and have niches framed by pilasters surmounted by a miniature temple roof and carvings representing makaras (aquatic monsters). The lintels of the shrine doorways are carved makaras or aquatic monsters, flying figures and garlands.